In the seventeenth century, glass furnaces represented a pinnacle of technology. True, the ability to achieve the high temperatures required to melt glass had been around for centuries – high enough to melt gold, silver and copper as well. What made the glass furnace remarkable was its refinement. It made efficient use of its hardwood fuel and was able to maintain a controlled, even temperature long before any thermometer could measure it. In fact, Galileo was only just beginning to use glass bulbs and tubes to measure differences in ambient room temperatures. 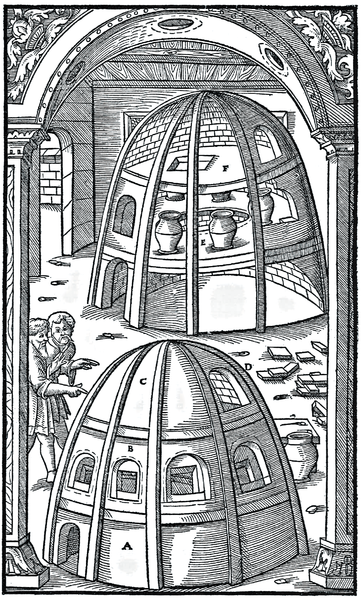 In Florence, the construction used was typical of the time throughout Europe, called a "beehive" furnace because its shape resembled the elongated dome of a beehive. A double wall, built of fire resistant bricks, provided further insulation, trapping heat inside. Vertically, the furnace was divided into three levels, each forming a wide open chamber. The bottom space was used to build the fire, and had one or two openings to the outside, used to add wood fuel, rake the coals, or shovel out ash. The second, central level was where the pots of glass resided. A central hole or "eye" on the floor directly exposed the fire pit below. The space directly next to the eye was the hottest, and temperature could be further controlled by moving the crucibles farther away or closer to the eye. A number of openings in the wall allowed gaffers access to the glass pots, and at least one larger opening was used to place new crucibles, or rearrange the existing ones. The upper chamber was used to control the draft, and sometimes for annealing. Again, a central hole in the floor of this (top) level allowed exhaust gasses to leave the glass chamber and an opening to one side vented the exhaust. In his book, L’Arte Vetraria, Neri is careful to stress that only dry oak or other hardwood should be used because it burns cleanly, and will not deposit ash or creosote in the glass. The furnace should have dry wood, hard wood of oak because soft wood tinges the furnace and does no good. Stoke it steadily and continuously so that the flame is always clear, and there is never any smoke, which is very important in order to make a beautiful cristallo. Once a finished piece of glassware is made, it must be allowed to cool slowly, over a period of many hours. This was often accomplished by building a long enclosed horizontal trough that connected to the furnace. A draft opening at the far end allowed heat from the furnace to be drawn in, and finished pieces were placed in a pan at the furnace end and then slowly pulled by a chain further and further down the trough toward the cooler end. This "annealing" process ensured the glass would not develop stresses and crack as it cooled. Although Neri does not concern himself with the vagaries of furnace construction in the book, it is clear that he did possess considerable knowledge on the subject. Several of his unconventional methods for making pigments for glass involve taking bricks out of the furnace wall to stash chemicals for long term exposure to the heat. Take small pieces of copper and put them inside the arches of the furnace. In that place, they will be within the walls. Leave them that way until each piece of copper is well calcined, using a simple fire. While it is true that artisans of the early seventeenth century did not possess the same understanding of nature that we now enjoy, they did have a working knowledge that served them very well. It was backed by a theoretical framework that was quite sophisticated and was consistent with what could be observed and measured at the time. This is no different from our own modern understanding of nature: sophisticated and consistent with what we can observe and measure.